Since returning my main focus to the fields of Augmented and Virtual reality I have experienced more light-bulb moments than at any time in my previous career. They have lead me to thinking deeply on the future of human computer interaction and more specifically natural user input. Computer input has traditionally involved us translating an input methodology from one form into another i.e. moving a mouse on a table to cause a cursor to move on a screen and if the goal is 3D modelling then another leap in cognitive load is required using the cursor to control 2D tools to affect a 3D environment. Consider positioning a point in 3D space using the views in 3D modelling software. I often use the orthographic views; views which view my model without perspective from the side and top, etc. 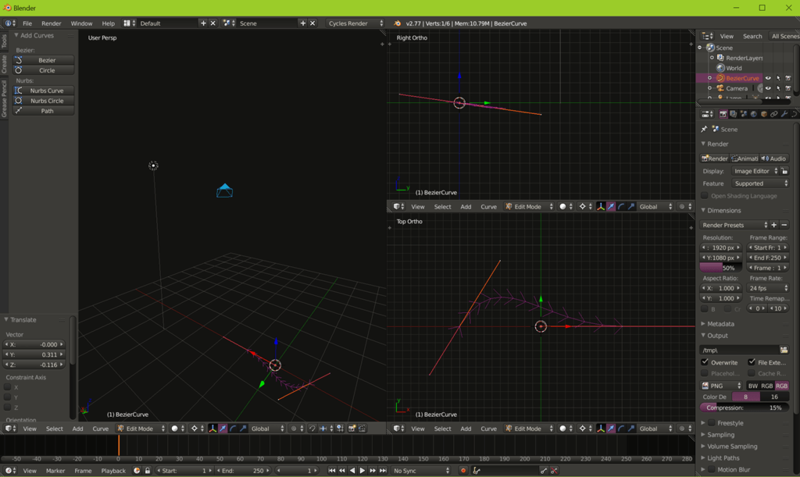 to position points in one 2D plane at a time rather than trying to use a 3D view with a 2D cursor. Also, consider the complexity of the software in general – quite a steep learning curve. 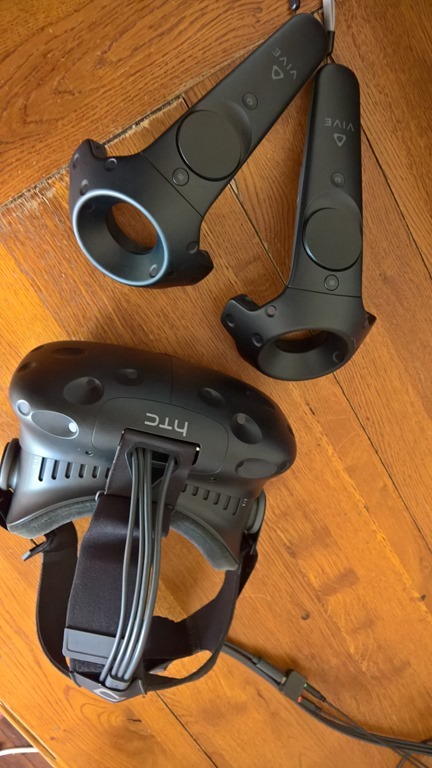 If you aren’t familiar with the Vive it is a virtual reality headset which allows six degrees of freedom so the rotation of your head is tracked and used to control your orientation inside the virtual environment but also the position of the headset is tracked allowing you to move up and down and side to side. This enables what is known as ‘room-scale’ applications as opposed to seated experiences which only allow rotation. Along with the headset there are also motion tracked controllers; one for each hand. This requires a fairly high-spec gaming PC to run. My daughter took the controllers instinctively and began drawing in 3D space. After experimenting for a while with the brushes she created a house using the straight-line tools and wallpapered it with a different brush. So she had created a 3D house that she could walk around and inside. There is no way she would have been able to achieve this in more traditional 3D modelling software. After experimenting with the coolness of the brushes that you can paint with and getting to grips with the fact that when you move the brush from left to right you actually draw an arc and not a straight line then you can freely express your creativity in a new way. Then you can view your creation from any angle just by walking around it. The cost of the equipment will currently present a barrier to widespread adoption but imagine the possibilities as the hardware becomes more accessible and the software becomes more sophisticated. 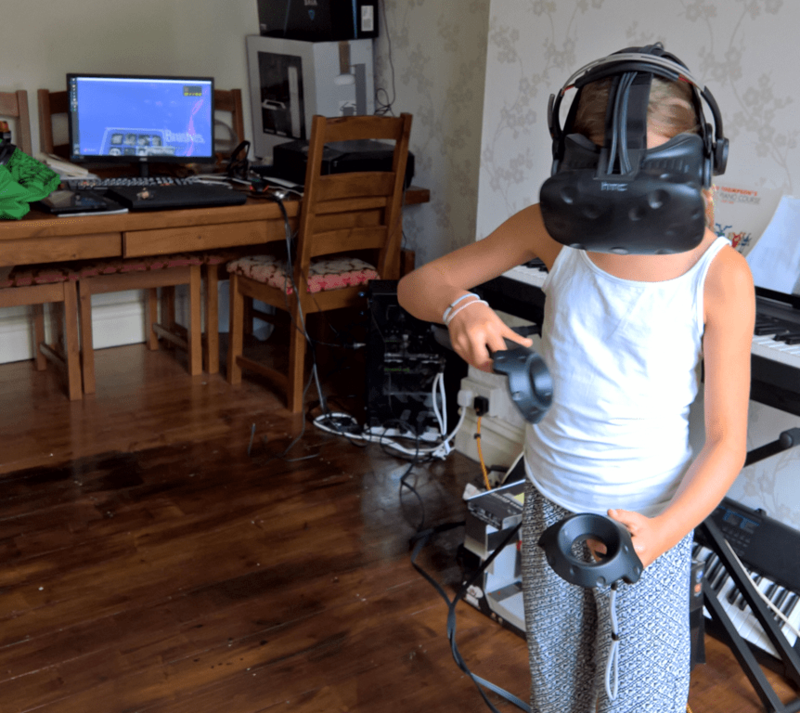 Tilt Brush is designed as a painting package but the potential this has for 3D modelling is very interesting. Lightbulb moments like this don’t happen all the time. In ten years I’ll probably look back and think it was obvious, but right now, I’m really inspired by the potential.